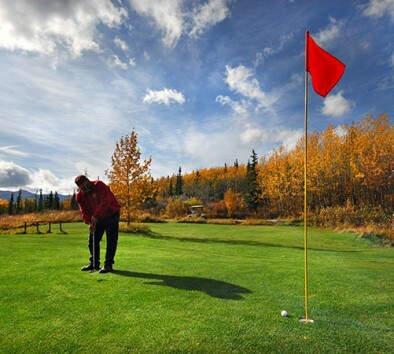 Hit the greens during this spectacular expedition to Black Diamond Golf Course—a one-of-a-kind Alaskan course surrounded by stunning scenery. The adventure begins with a picturesque drive to the rugged, nine-hole course bordered by gorgeous mountains and tranquil Otto Lake. Constructed in 1995 on Alaskan tundra with little to no topsoil, this unique course offers challenging grass that evokes Scottish courses of yesteryear. Hazards include moose prints, tundra marsh, and permafrost so the ground can be totally frozen in some areas and a crafty fox that enjoys stealing balls. Since unlimited greens fees, golf balls, club rentals and a power golf cart are included, you can relax and take in the magnificent panoramic views, clean air and robust colors spanning this 3,000-yard, par-35 course. Relish the vibrant wildflowers surrounding each hole and watch for wildlife while teeing off under the Midnight Sun. Receive a souvenir logo golf ball so you can take a piece of this inimitable place home. A full service family style meal is included. The Black Diamond Golf Course was built on frozen ground; therefore, there will be uneven surfaces. Pricing includes power golf cart, clubs and golf balls. Both left and right handed clubs available. No specific attire required to golf. Wildlife sightings are likely but not guaranteed. Round of golf is approximately 3 hours.